Hola Fam! We'll start off with a bit of news - transfers are today! 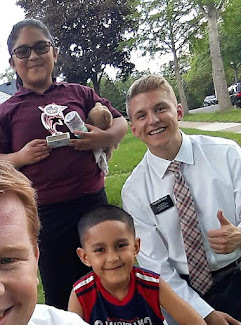 Elder Nielson and I will be staying another 6 weeks here in Faribault, which is great news for us because we are loving it here. And some other news... It's his birthday Today!! To celebrate I'm going to take him out to lunch, then hit up Cabela's, and go play soccer with our soon to be baptized little amigo Derek. We met with them again this week and they are such a sweet family! Things are looking good for his baptism in November. So more about the week... We started off with some exchanges in my last area, Mankato. We spent the night there so we were there for Tuesday and Wednesday. Honestly, it felt like I never left! It was a blast, and the elders there are studs. I spent the day with an elder from Alaska, who is a convert of 4 years and the only member of our church in his family. Such an amazing example of faith! With the recent addition of Facebook and Skype to our mission, he has been able to start teaching his mom more about the restored gospel! We got to have a lesson with her over video-chat and it was the coolest thing in the world! The blessings of technology are unreal. We've seen a lot of success in this area with part-member families! We're working with the Sando family, the Hispanic family that came to the BBQ the Chavez's, and Mary Jane Post and her non-member boyfriend. Well, anyway, a funny story. We went over to Mary Jane and Chase's for dinner on Friday. We had some delicious tacos with them, and her three daughters are just full of energy and love to talk. It was hilarious, the little 3-year-old was going off about this random dream she had and it made absolutely no sense but we just laughed along with her😂. Then Mary Jane started to tell us a different story, when Alison (the 3 year old) walks over to her and tells her, "hey mom, can I tell you something?" And she was like yes. Then she leans in and whispers, "I wasn't finished!". The sass was unreal😂😂. So, then we listened to her crazy "dream" for another 10 minutes hahaha. We were dying😂. I love that family though. Chase has been reading a bit of the Book of Mormon and got to watch General Conference which he loved! They got in a car accident on Saturday that scared them a bit, but luckily everyone was okay. We went over there after church and shared with them a scripture. I'm running low on time, but just a quick thought. On Sunday we had a super powerful Ward Conference and got to hear from all the leaders of the Lakeville Stake. I actually had the same conference when I was in Mankato, but it was even better the second time! The theme they used comes from a scripture in the Book of Mormon comparing our testimonies of the gospel to a living plant, specifically a tree. "But if ye will nourish the word, yea, nourish the tree as it beginneth to grow, by your faith with great diligence, and with patience, looking forward to the fruit thereof, it shall take root; and behold it shall be a tree springing up unto everlasting life." "And because of your diligence and your faith and your patience with the word in nourishing it, that it may take root in you, behold, by and by ye shall pluck the fruit thereof, which is most precious, which is sweet above all that is sweet, and which is white above all that is white, yea, and pure above all that is pure; and ye shall feast upon this fruit even until ye are filled, that ye hunger not, neither shall ye thirst." What a powerful analogy! If we turn to the Lord and diligently nourish our "trees", (Pray, read scriptures, serve others, etc.) we can be deeply rooted in the gospel. And with strong roots, the winds of life in this trouble-some world will not have power over us! I know this to be true, and I've tasted of this "fruit" of the gospel and it is the true joy that is experienced through the restored gospel of Jesus Christ!